The National Liberation Army (ELN), considered a terrorist organisation by the US and the EU, said they would not be cowed into hiding if the Americans invaded the oil-rich country in the midst of political turmoil. Leaders of the Marxist group which recruits Venezuelans as young as 15 said they are preparing a military strategy to ensure they would not be caught off guard if Donald Trump gave the order for troops to be mobilised. Speaking in Cuba, the exiled commander of the the ELN, Israel Ramirez Pineda, also known as Pablo Beltran, insisted his soldier would be ready to fight back against any aggression from the Americans. He told the Sunday Telegraph: “It’s certain that the USA’s attack plan would mean that we’re the first in line. The Colombia-based rebel army operates in the mountains along the 400-mile border of Venezuela and Colombia where they dabble in illegal gold mining among other illicit trades. Last month, the militants claimed responsibility for a deadly car bomb in Bogota which left 21 police cadets dead and 68 injured. US national security adviser John Bolton refused to rule out a military intervention in Venezuela, saying “all options are on the table”. The Trump administration is keen to see the end of President Maduro’s reign and has recognised Venezuela’s opposition leader Juan Guaido as legitimate leader. Mr Bolton was spotted holding a notepad which read “5,000 troops to Colombia” and accused President Maduro of “flying out Venezuelan assets by the plane full” after plans came to light he was to sell 29 tonnes of gold to the UAE. 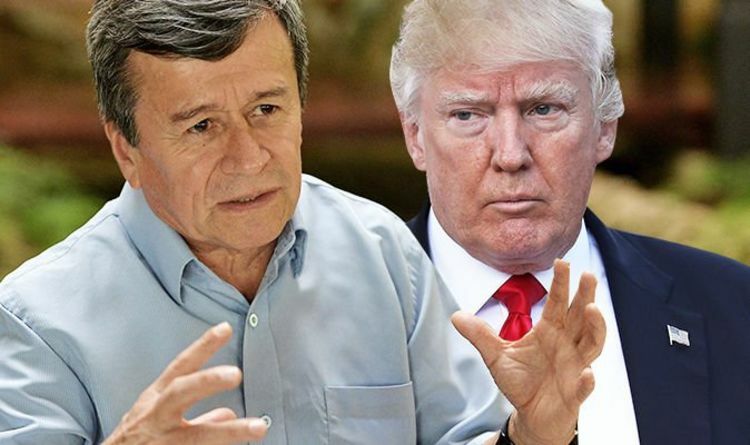 The embattled president has accused Mr Trump and a “group of extremists around him” of plotting to topple him to gain access to Venezuela’s vast oil reserves, warning that military action would turn the crisis-stricken country into a new Vietnam. Since the early Sixties, the ELN has been fighting to establish a communist state and according to Insight Crime, a think tank based in Colombia’s capital, the group is present in more than half of Venezuelan territory. Mr Beltran said although he is not interested in growing the ELN’s ranks, saying large numbers of fighters would make them “easy targets”, he said Venezuelan-based supporters of his group number in the millions. “Sometimes we cross into Venezuela because in some ares the border is an imaginary line,” he added.